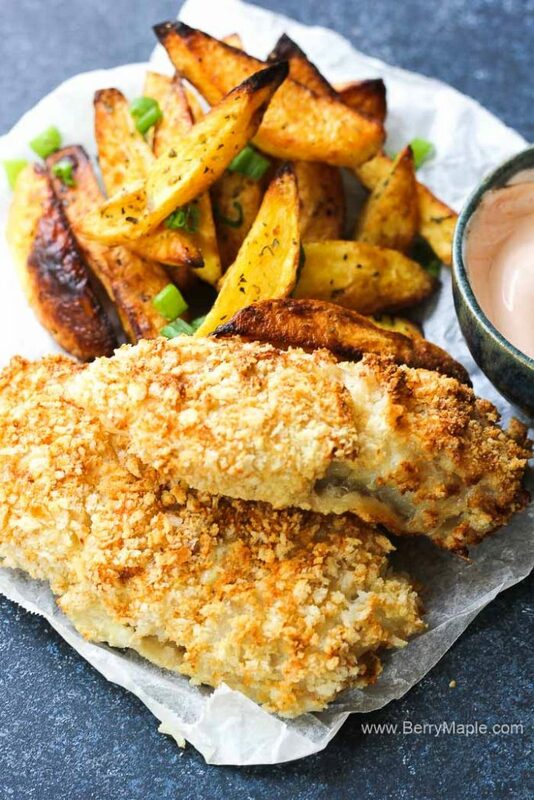 Air fryer fish recipe that is served with crunchy potato chips. Easy, healthy and ready in no time! For this recipe you can use any fish, cod, tilapia, catfish even salmon and more! 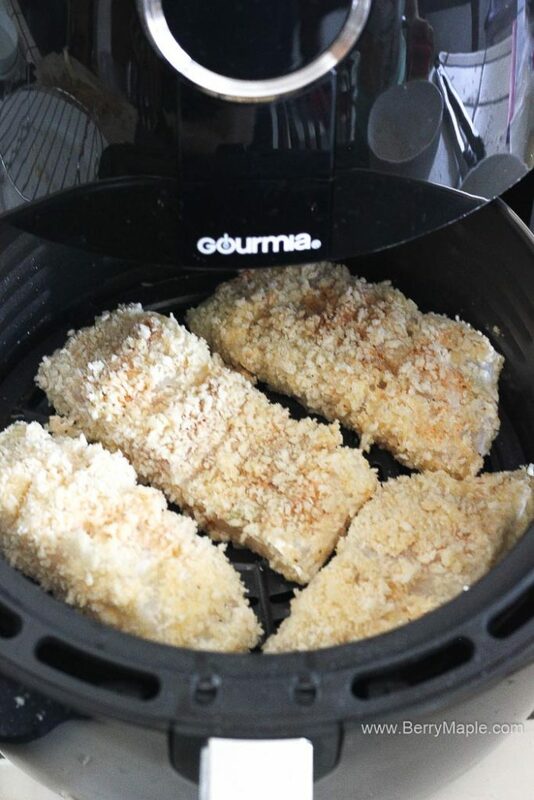 Who knew that you can cook amazingly crunchy and velvety soft fish in the air fryer, that actually will be healthy for you? No dealing with greasy oil and extra calories. For this recipe i used frozen cod fillets, that i took out of the freezer about an hour before cooking time. Fish is so easy to defrost! If its a big piece- put it in the fridge overnight or for a small or medium piece- just leave it on the counter for an hour or two! 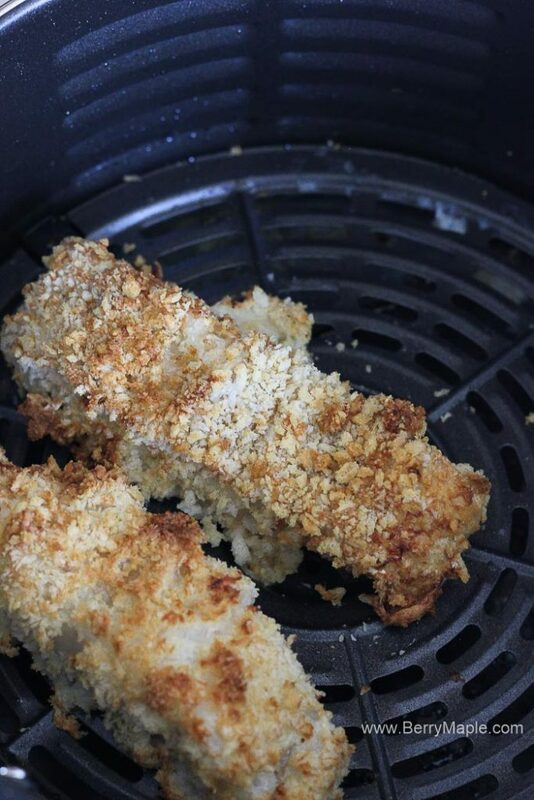 Well, i didnt try every fish in the air fryer, but i can tell then so far my favorites are Catfish (love it!) , Tilapia, Cod and Salmon. Oh when they are buttered and then air fried- their texture becomes so silky smooth and absolutely delicious. Crunchy on the outside and heavenly soft inside- what could be better! How to make perfect air fryer fish and chips. Toss potato wedges in a bowl with some salt and oil. Add them to the air fryer (400F for 20 minutes). Shake the basket half way through. Remove cooked “chips” and put into a bowl. Serve immediately with potato “chips” and some aioli! Thank you for reading and trying my recipes. Your opinion is very important for me! Please leave a comment below if you made this dish! Also tag me and follow on INSTAGRAM at @myberrymaple . 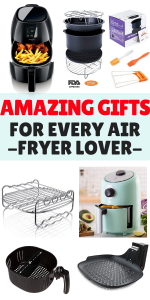 Make sure to check on this Must Have Air Fryer Accessories list! Be a part of a new growing community of air fryer lovers. I just started a new Facebook group, where i will post only best, trusted recipes from my site and my friends blogs. Be the first to get new recipes! Cut potatoes in wedges or like french fries. In a bowl, toss together potatoes. salt and oil. Add potatoes in to your air fryer basket and cook on 400F for 20 minutes, shaking twice. Once done remove from the basket. Meanwhile, prepare the fish. In a shallow bowl add flour, in a second bowl add beaten egg and in the third bowl add Panko. 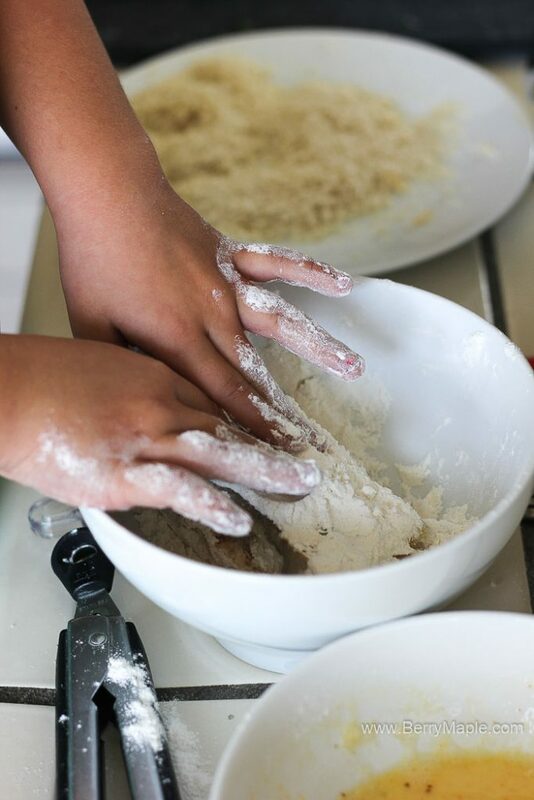 Working with one piece at a time, dredge fish fillet first in flour, then in egg, and then in breadcrumbs. Add fish to the air fryer and set it to 330F for 15 minutes. Check on it halfway through and flip if needed. Can you coat fish with batter? I may have misunderstood, where and when do you add the butter? Love using my air fryer. Making this tonight. 2/7/19 I didn’t follow recipe to the letter. I didn’t make the potatoes because I didn’t have any. Used frozen cod steaks. Dusted with flour, dipped in egg whites and used left-over Panko with Parmesan Cheese mixture to coat. Air-Fried at 375º for 20 minutes because they were frozen. They were great! Thanks for the recipe! Can you make this with fresh fish filet, or is frozen recommended? Tonight is my first time using my brand new air fryer and I’m so excited, but want to be sure I’m using the right fish lol. Hi! Fresh fillet is even better 🙂 hope you will like it ! OMG the coating on your cod looks incredible! I love how crispy it got in the air fryer. 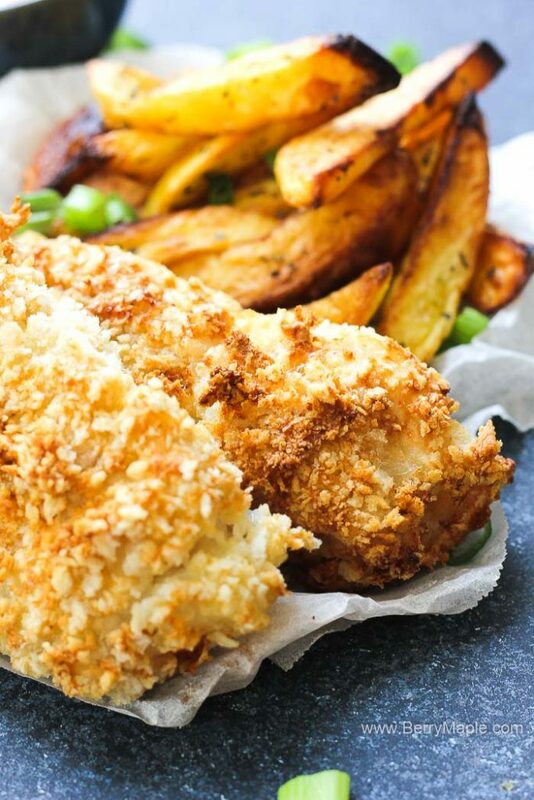 My family loves fish and chips – this would be a huge hit at my dinner table! Your fish and chips are making my mouth water! It looks so crispy and delicious. I’ve been wanting to get an air fryer for a while now. It’s going on my Christmas list for sure! Thanks so much for sharing the recipe. Oh wow – that coating looks so crunchy and delicious! 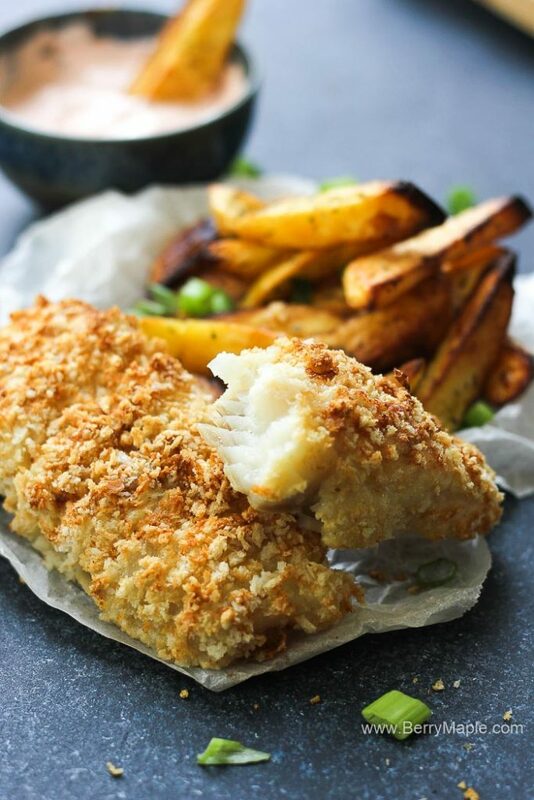 I love this healthier version of fish and chips – yum! Wow..fish and chips in air fryer! 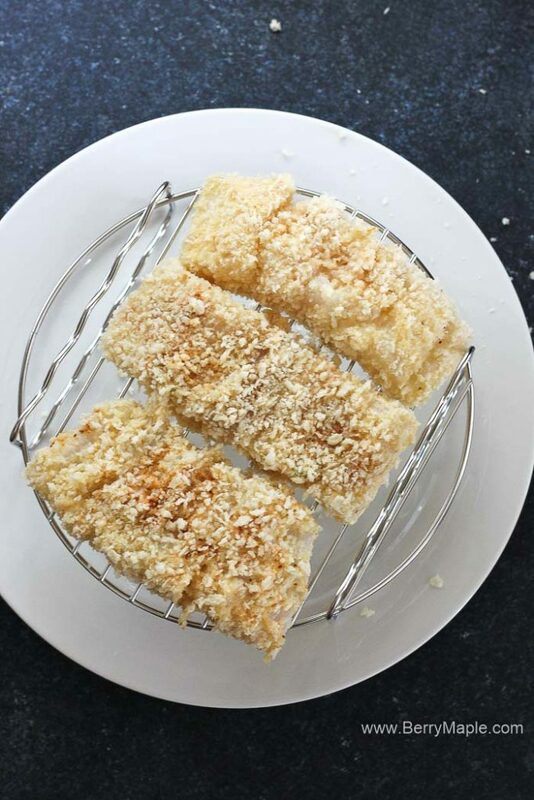 What a healthy treat, and using panko makes everything so crispy and crunchy. Wow, I need to get an air fryer! This fish looks perfectly cooked, so lovely and golden and it looks like it would just melt in your mouth! Yum! I love fish and chips! It’s the first thing I get whenever I’m in the UK, that’s how much I love it. Thank you for coming up with a healthy alternative for this delicious dish! My entire family loves fish and chips but I get so worried to feed my family greasy deep fried fish and chips. This air fried version looks like the best way to enjoy fish and chips with the worry and guilt. Yum! 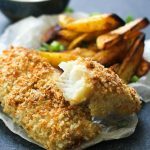 Fish and chips is always a winner in our house, and I’m a big fan of cooking with an air fryer. I love ‘fish and chips’ and just because of that I need an air fryer. This looks so beautiful I love you how pretty the color is. The air fryer is on my Wish List. Mmmmm! This takes me back to my years I lived in England. 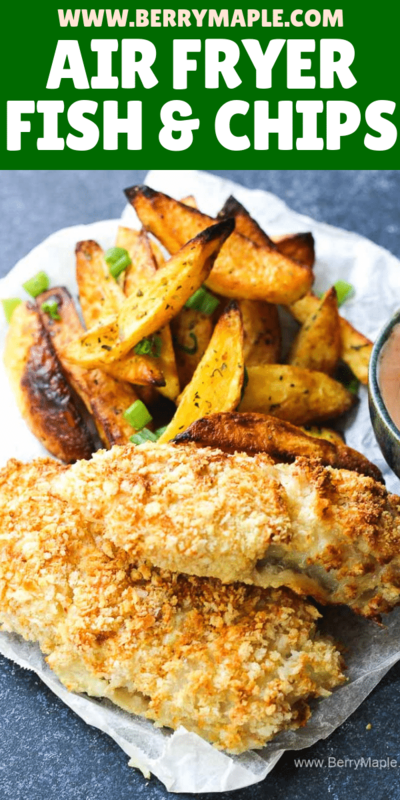 Fish and chips were as common as….well, you could get them anywhere! This is great inspiration for my new air fryer. If you don’t already have an air fryer, this recipe is going to make you want to buy! YUM! I love that you chose to use panko instead of breadcrumbs, it looks sooo crunchy!